When my family goes camping, I always pack a couple of bottles of skin safe bug repellent that we can rub or spray right into our arms and legs to keep mosquitos away. The bug repellant is a blend of skin nourishing essential oils plus lemongrass, and I add the oils to a base of organic aloe vera gel. Natural aloe very gel is scraped from the leaves of the aloe plant. It is a beige, milky color and has the consistency of a thick liquid and is easy to spray from a misting bottle. It should look like this: …and how my bug spray became deodorant. 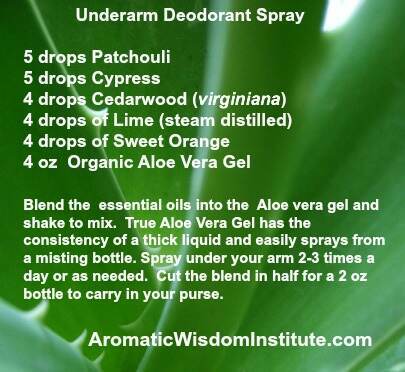 I strongly suggest that you make several underarm deodorant sprays with different oils to avoid essential oil sensitization. 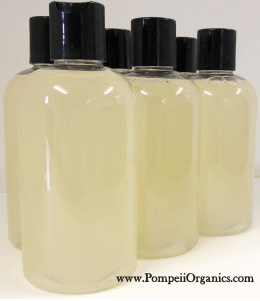 You can buy all the ingredients you need, including the spray bottle at PompeiiOrganics.com. If you subscribe to my free newsletter, you’ll get a special code that will give you 15% when you check out. I am forever puzzled by people promoting natural products that are then packaged in plastics. What chemical has been added to the aloe vera to make it gel form? Hi Misty, I agree, is does seem contra-intuitive to add beautiful organic products into plastic bottles. In our classroom, when students create blends, they have their choice of glass containers or PET plastic which does not contain BPA. PET is globally recognized as a safe, recyclable packaging material. Numerous tests have created a broad scientific consensus that PET is non-toxic and is a safe material for the storage of food and beverages. There are no chemicals added to the aloe vera gel we use in the classroom. This particular gel is created by removing the inner pulp of whole Aloe Vera leaves, then sent into a cold pressed production facility. It is a naturally thick product. It also has natural preservatives of Potassium Sorbate, Citric Acid and Xanthan Gum. Hey Liz. Thanks for the recipe. My boyfriend and I are very outdoorsy, so we will try this out for sure! We’ve been using Lavilin all-natural underarm cream and it’s pretty good. We only need to use it once or twice a week to eliminate all odors, so when we go away for a few days we don’t even need to pack the deodorant. Expensive though!